Famous for its Tripurantakeswara Temple, Tripurantakam is a village in Prakasam district of the Indian state of Andhra Pradesh under Tripurantakam mandal in Markapur revenue division. As per Siva Puranas, Siva destroyed Tripurasuras (3 demons ruling three cities) here. Since Lord Siva destroyed these demons along with the cities, he is called as Tripurantakeswara and this place is called as Tripurantakam. Sri Parvati sahita Tripurantakeswara swamy temple is located on the top of the hill named Kumara Giri and there is a secret underground passage to Srisaila Kshetram from this temple premises. Below the hill, in a pond, is Bala Tripura Sundari temple. Tripurantaka Bala Tripurasundari Devi (swayambhu) is the first incarnation of Adiparasakthi. Here she resides in the form of a little Girl. She helped Lord Siva in destruction of Tripurasuras. Goddess Sri Tripura Sundari temple is located on the bottom of the hill in the middle of a pond(Cheruvu). Sri Bala Tripurasundari Ammavaru is located in Garbhalayam with a pleasant form giving a great Darshan to the devotees. Goddess here is decorated with silver ornaments and always is decorated with lemon fruit campaign. Jagadguru Sri Sri Sri Aadishankaracharya had installed Srichakram infront of Sri Bala Tripurasundari Ammavaru. Since the installation of Srichakram, Kumkumarchana is being done daily here. Lord Siva killed a demon called Tripurasura with goddess Sri Bala Tripura Sundari Devi at this place in Kritayugam. So this place is named as Tripurantakam. This is an holy place where a collection of Saivam, Sakteya, Kapalika Sampradayas can be seen. In ancient days many Sages and saints had performed penance here and also practiced mantrika, tantrika vidya and also siddha yoga here. On the hill side from Sri Balatripura Sundari temple, Sri Tripurantakeswara swamy temple is located. The temple is located on the top of the hill where there is a ghat road to reach by vehicles. And also there are steps for devotees who wish to reach the temple by walk. There is a Rajagopura at the entrance of the temple with a height of nearly 80 feet. The great sculpture of the temple exhibits the glory of Haindava dharma. The construction style of this temple is mostly different from all other temples in Prakasam district. Sri Tripurantakeswara swamy is located in Garbhalayam in the form of Siva Lingam. Sri Tripurantakeswara swamy have been getting Archana’s and Abhisheka’s daily. 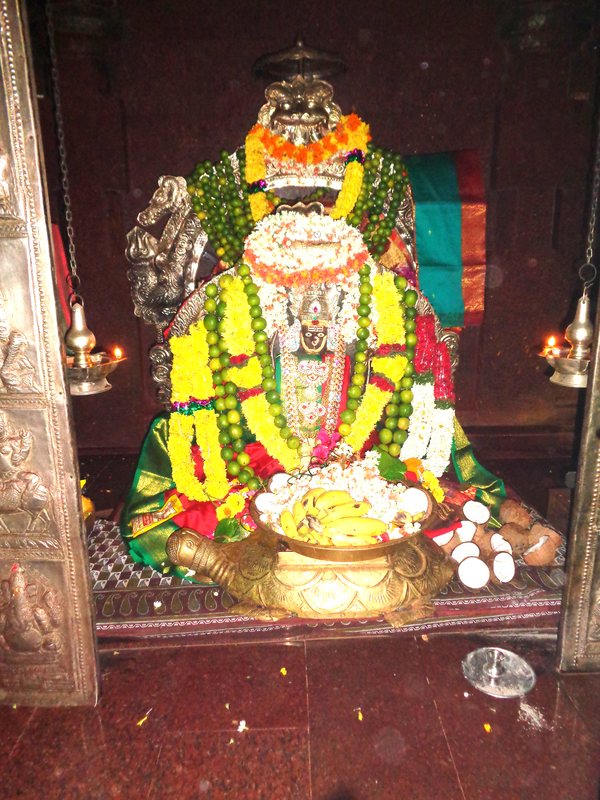 Sri Veerabhadra Swamy is also located in the temple after Garbhalaya. There is a cave in this temple which starts from this temple and ends at Srisailam temple. In ancient days saints and sages performed penance and yoga, Dhyanas in this cave and making journeys from Srisailam to this temple. There is a Chamarakarna Ganapathi idol at the South West corner of the temple. Sri Chamarakarna Ganapathi idol is 6 feet in height and gives a great darshan to the devotees. Kadamba Vruksham is very famous tree of which Lord Tripura Sundari Devi likes alot. We can see this tree only in Kasi and then in this place. Srichakram- Earlier, Lord Tripurasundari Devi was in Ugra Roopam where devotees were afraid to Darshan her. So, Sri Aadi Shankaracharya established Sri chakram to make her cool, so that all the devotees can visit this punyakshetram and can fulfill their lives.